We start the quasiregulars with thah, the second member of the oct regiment. After thah are four regiments with rectangular verfs, each of which has a polyhedron with a rectangle verf and two "hemi" polyhedra with bowtie verfs. Finally comes the ditrigonary regiment consisting of sidtid, ditdid, and gidtid. Except for oho, all of the hemis including thah are non-orientable, the remaining polyhedra are orientable. Sidhei, gidhid, and geihid look different due to the neo filling, I'll also have renders of the traditional filling at the end. Co and id are convex and therefore are part of the Archimedean solids. Thah has 6 vertices, the co regiment has 12, the sidtid regiment has 20, all others have 30. There are a few polychora that has thahs for cells, and plenty of them have the members of the co and sidtid regiments as cells. Id, did, and gid also show up quite a bit as cells, but the dodecahedral hemis (sidhei, etc) only show up in their prisms. The polychoron categories most similar to this one are 3, 4, 5, 17, 18, and 23. 20. 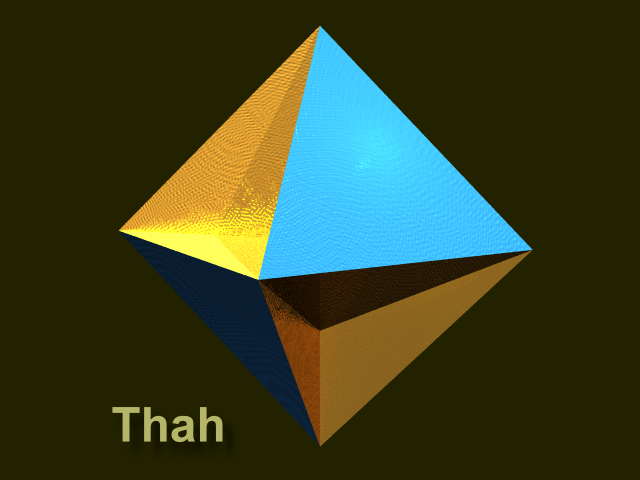 Thah - (THAH) tetrahemihexahedron. Symbol is xo,x/2. Faces are 3 central squares and 4 triangles. 21. Co - (CO) cuboctahedron. Symbol is ox'o, also xox. Faces are 6 squares and 8 triangles. 22. Oho - (O ho) octahemioctahedron. Symbol is (xo,x). Faces are 8 triangles and 4 central hexagons. 23. Cho - (CHO) cubihemioctahedron. Symbol is (x'o"x)/2. Faces are 6 squares and 4 central hexagons. 24. Id - (ID) icosidodecahedron. Symbol is ox^o. Faces are 12 pentagons and 20 triangles. 25. Sidhid - (SID hid) small dodecahemidodecahedron. Symbol is (x^o^'x^)/2. Faces are 12 pentagons and 6 central decagons. 26. Seihid - (SI hid) small icosahemidodecahedron. Symbol is (xo,x^)/2. Faces are 20 triangles and 6 central decagons. 27. Did - (DID) dodecadodecahedron. Symbol is o*x^o. Faces are 12 stars and 12 pentagons. 28. Sidhei - (sid HI) small dodecahemicosahedron. Symbol is (x*o*'x)/2. Faces are 12 stars and 10 central hexagons. 29. Gidhei - (gid HI) great dodecahemicosahedron. Symbol is (x^o^'x)/2. Faces are 12 pentagons and 10 central hexagons. 30. Gid - (GID) great icosidodecahedron. Symbol is ox*o. Faces are 12 stars and 20 triangles. 31. Gidhid - (GID hid) great dodecahemidodecahedron. Symbol is (x*o*'x*')/2. Faces are 12 stars and 6 central decagrams. 32. Geihid - (GI hid) great icosahemidodecahedron. Symbol is (xo,x*')/2. Faces are 20 triangles and 6 central decagrams. 33. Sidtid - (SID tid) small ditrigonary icosidodecahedron. Symbol is (ox*o). Faces are 12 stars and 20 triangles. Verf is a ditrigon. 34. Ditdid - (DIT did) ditrigonary dodecadodecahedron. Symbol is (o*'x^o). Faces are 12 stars and 12 pentagons. Verf is a propeller tripod. 35. Gidtid - (GID tid) great ditrigonary icosidodecahedron. Symbol is (ox^o,). Faces are 20 triangles and 12 pentagons. Verf is a tripod. Below are the traditional fillings for sidhei, gidhid, and gidhei. Conjugate Pairs: id-gid, sidhid-gidhid, seihid-geihid, sidhei-gidhei, sidtid-gidtid. Self Conjugates: thah, co, oho, cho, did, ditdid.